Ceramic labeled in an inappropriate place on its broken edge. Photo courtesy of Alexandria Archaeology, City of Alexandria, Virginia. Once a catalog number has been assigned to an object or lot of objects, that number must be attached to the object(s) for identification purposes. Every item should be labeled in the most permanent method applicable to its material and status in the collection, yet be reversible if the label must be removed or changed. The method used to label an object depends on a variety of factors. These include: physical stability of its surface, its surface roughness, its porosity, its physical strength, and its flexibility. It is important to use methods and materials that are appropriate to the object and do not harm it in any way or, in other words, are chemically stable. The label number should be placed in an area that does not impact important diagnostic or aesthetic parts of the object, and minimizes the handling needed to view the number. Clean (if necessary) the area to be labeled. Place a thin coat of clear reversible lacquer (e.g., Acryloid B72 or B67) on the labeling area. If the artifact is dark in color, use white lacquer for the base coat. Multiple applications may be necessary on porous objects, such as unglazed ceramics. Let the base coat dry thoroughly. Write the label information on top of the base coat using a permanent water- or pigment-based ink (e.g., India ink). Let ink dry completely. Apply a topcoat of clear varnish (e.g., Acryloid B72). Let the label dry thoroughly before placing the object in a container. Record labeling methods and materials used in appropriate object information file. It is possible to remove a label if it is incorrect or applied in the wrong location. If a base coat and inked label have been applied, the ink may be removed with a cotton swab slightly moistened with water. This will not affect the lacquer base coat for the application of a new number. If all three layers have been applied, the lacquer and ink may be removed with careful application of the solvent acetone. Some objects cannot be labeled directly. They may be too small or have unstable surfaces. 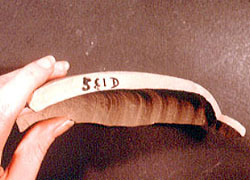 Most paper, basketry, leather, textiles, and wood should not be marked directly. Acid-free tags may be attached to these objects by tying or sewing. Or, they can be placed in the sealed container with the object or on the housing of the container. When attaching labels, use materials compatible with the object and its storage location. In general, string or thread should be softer than the artifact's surface, should not cut through or into the object, should not be attached too tightly, and should not be colored or dyed. Proper labeling of associated records, including photographs, audiovisual materials, and digitized data, is also essential. It provides a means to relate one or more record to specific objects or collections in order to obtain key provenience information about particular material remains or other analytical information. Again, labeling techniques, as well as the amount of information on the label, depend on the media. It is best to place paper records in acid-free folders and label the folders. The labels may be handwritten in carbon ink or pencil, typed, or computer generated on archival adhesive labels (though these may eventually fall off). If paper documents must be labeled directly, preferably in the same location on each sheet such as on a reverse edge. If using pencil, such as a #4 graphite (2H), apply very little pressure and write very small. Critical information on the label should include: collection name and/or number, box number, and file number. Accession number, unique file title, and date may also be included. Labeling photographic materials begins with proper handling. It is always wise to wear gloves (cotton or natrile) since the acid on fingers may cause permanent damage. Each image (negative, slide or print) should be stored in its own envelope or sleeve made of inert plastic or unbuffered paper with a neutral pH, high alpha cellulose, and lignin free, since buffer can damage photographs. Each image must be labeled with a unique identifying number. Photographic prints, slides and negatives should be labeled on the file, sleeve, or on unbuffered paper with a neutral pH, high alpha cellulose, and lignin free inserted in the sleeve. Prints also may be labeled directly in the border area of the reverse side, using indelible or permanent ink. Care should be taken to minimize the pressure applied when writing since it can cause the emulsion to crack. Negatives should never be directly labeled. The most critical information on photograph labels is: collection name and/or number and unique identifying number. Typed or computer generated archival adhesive labels should be used for audiovisual materials on tape or reel and for electronic diskettes. These labels should contain collection name and/or number, accession number, unique identifying number, and a brief description of the contents. Diskette labels should also include the software, version, size and type of file(s), and date. Below is a list of some materials that may be used for labeling and some that should be avoided. A conservator should be consulted on any questions about labeling. Whatever method is chosen, it is important to document all materials and methods used for both the objects and records.